How many roles must someone inhabit in the Marvel Cinematic Universe before they’re given a solo project of their own? 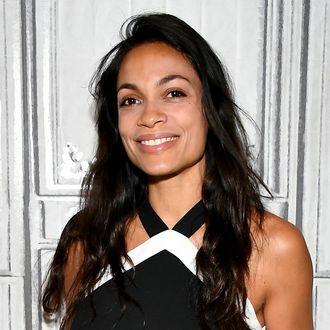 Ask Rosario Dawson, who is reportedly in talks to join Fox’s X-Men spinoff New Mutants as yet another Marvel character. Dawson has been in every single one of Netflix’s various Marvel series, including the upcoming Defenders, as the heroic nurse Claire Temple and the common denominator among all four of those superheroes. But for New Mutants, she’ll reportedly graduate from nurse to doctor, playing Cecilia Reyes, an M.D. with the mutant power to generate a force field around herself. (And who, like Claire, also helps Daredevil in the comics, but let’s not make this even more confusing.) Reyes will act as the Professor X of this spinoff, in that she’ll be a mentor to Maisie Williams’s Wolfsbane, Anya Taylor-Joy’s Magik, and the rest of the new generation. (James McAvoy’s Professor X reportedly won’t be a part of this film, and neither will Alexandra Shipp’s Storm.) Because the MCU now revolves exclusively around Rosario Dawson.